It’s now been 11 years since I started collaborating with marine scientists to help them on the field. From the beginning my idea was to be the link between them and the animals they work with for their research using my freediving skills but more important, my experience in the water. This winter I spent time in the Eastern Pacific waters. I think it is my favorite part of our Oceans. It’s extremely productive in terms of biomass due to the currents and the spectacular topography. Anything is possible, you never know what you’ll encounter. I like these kind of oceanic volcanic places, the conditions aren’t easy and predictable but when things come together nothing can even come close, it’s one of the reasons why I decided to base myself several months per year in the Azores islands. You have to spend lots of time at sea, be persistent and be ready for when the the conditions are good, then you can be rewarded. 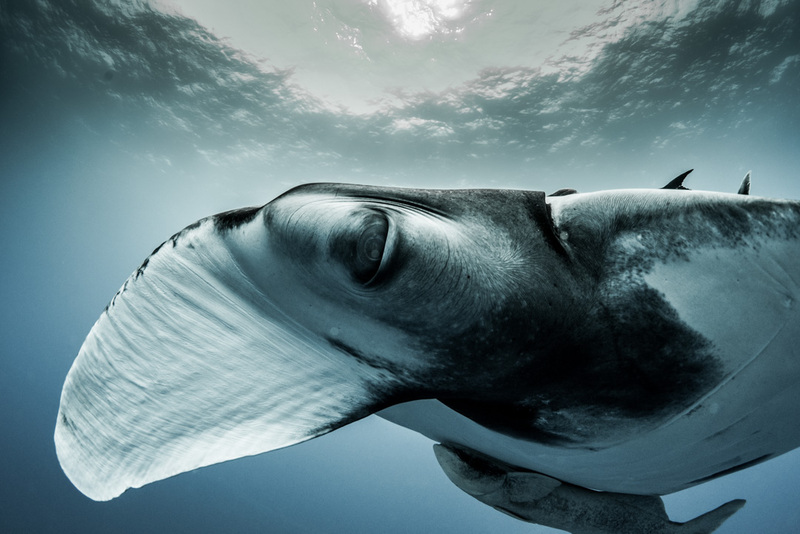 The expedition was aimed at helping the Pelagios’s team to place satellite tags the scalloped hammerheads roaming the waters of Revillagigedos archipelago. The lead scientist of the expedition James Ketchum and I embarked this time on Quino El Guardian, a 90 foot diving fishing boat convened into a diving liveaboard. I’ve worked with James since I started tagging sharks, we started our collaboration with two expeditions in Malpelo, an offshore rock 500km from the Colombian coastline which is also an eastern Pacific’s hotspot. Revillagigedos is an amazing location, four volcanic islands forming a marine preserve inscribed as a UNESCO world heritage site since july 2016. The islands are very exposed to the Pacific swells, currents and winds making it a rather challenging location to freedive. 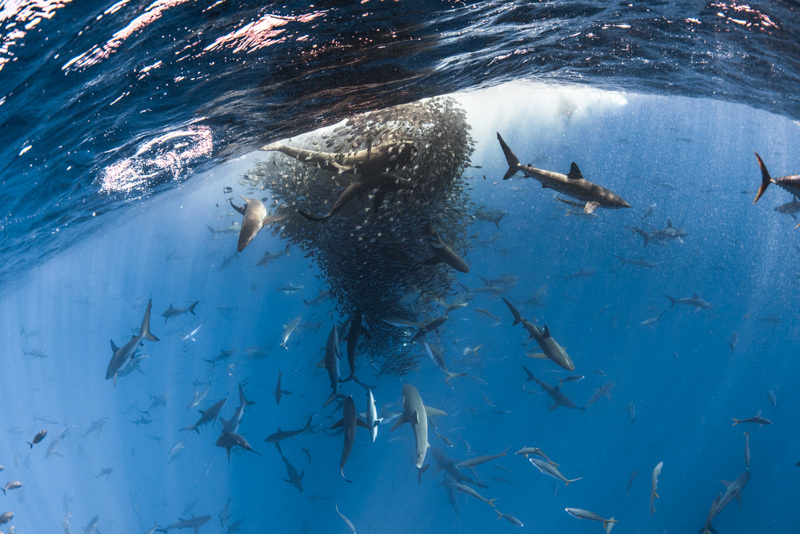 Winter months are good to encounter large schools of scalloped hammerheads. The species being in danger of intinction, assessing and monitoring the population is crucial. Marine preserves work well when properly managed and enforced but often the corridors between the protected areas are as important as the marine preserves themselves. 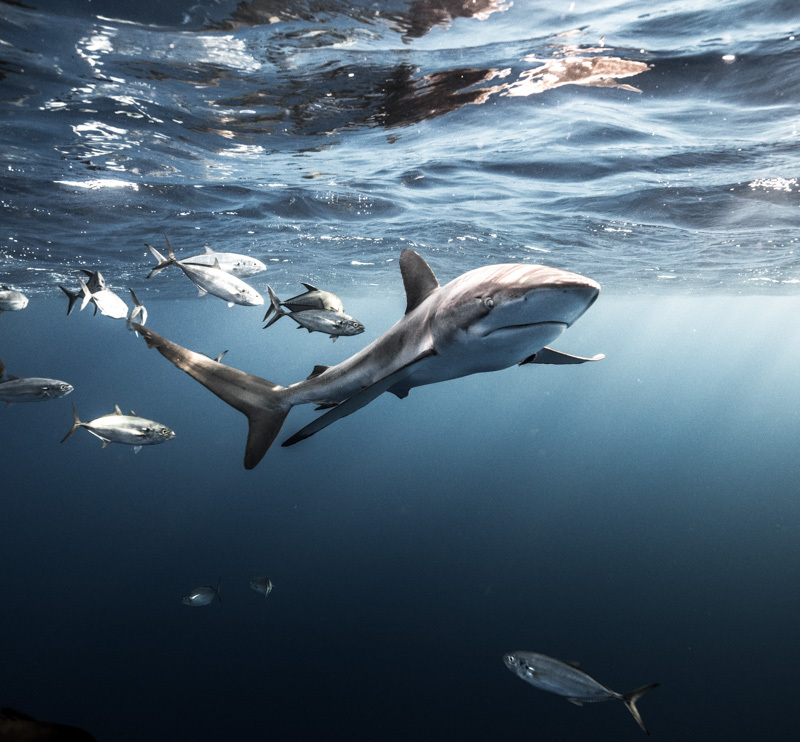 That is one of the reasons we want to learn more about movement of sharks between protected areas and eventually gathering enough datas and evidence of the interconnections to extend the sanctuaries to the corridors of the eastern Pacific. During the trip I spent countless hours in the water, up to more than 7 or 8h a day sometimes, to find hammerheads. They were staying very deep and were in low numbers compared to other years. Even diving down to 40m I couldn’t find animals to tag, or they were totally out of reach in 50 or 60m of water and far away in the blue or the ones I could find were too small to tag as we were focused on placing the transmitters on adults. Like in a classic movie, I had to wait the last minute of the last day to successfully tag an hammerhead! James and I were about to get back on the boat scheduled to leave soon from Roca Partida back to San José del Cabo. I did a last dive to 20m and I could spot a group of 25 hammerheads swimming in the distance in 30m of water. I swam back to the surface keeping my eyes on the sharks. When I reached the surface I couldn’t see them clearly, from time to time I could see one of them « flashing », a typical behavior of hammerheads consisting in rotate their bodies while swimming, their bellies being light grey they refelct the light and show their presence. After following the elusive group for almost 15min being stressed to loose them as we could only see a « flash » from time to time, I decided to take a chance, that would be the last dive of the expedition. Problem was that I had to swim a lot to follow them, the sea was very rough, there was current and wind, that to say these are far to be the best conditions to prepare for a long freedive. I took a last breath and dove down. The visibility was very good, more than 30m so I started to slowly glide towards the group of sharks, they were moving a lot, forward but also in circle. I had to try to predict what they would do to intercept the group and target one individual, be less than 2m from it before I could pull the trigger to release the shaft that would place the tag at the base of its dorsal fin. In these moments if you try to calculate, plan or think, it doesn’t work. You have to let go and trust your instinct and experience to be successful. I let go and intercepted the group, 3 sharks moved away to check me out a bit closer, I turned my head in the opposite direction not looking at them anymore to make them more confident and even more curious….it worked and one of them was now 3m under me….I angled a bit my free fall and took the shot. The shaft went in and the shark left with the PAT satellite tag firmly in place. 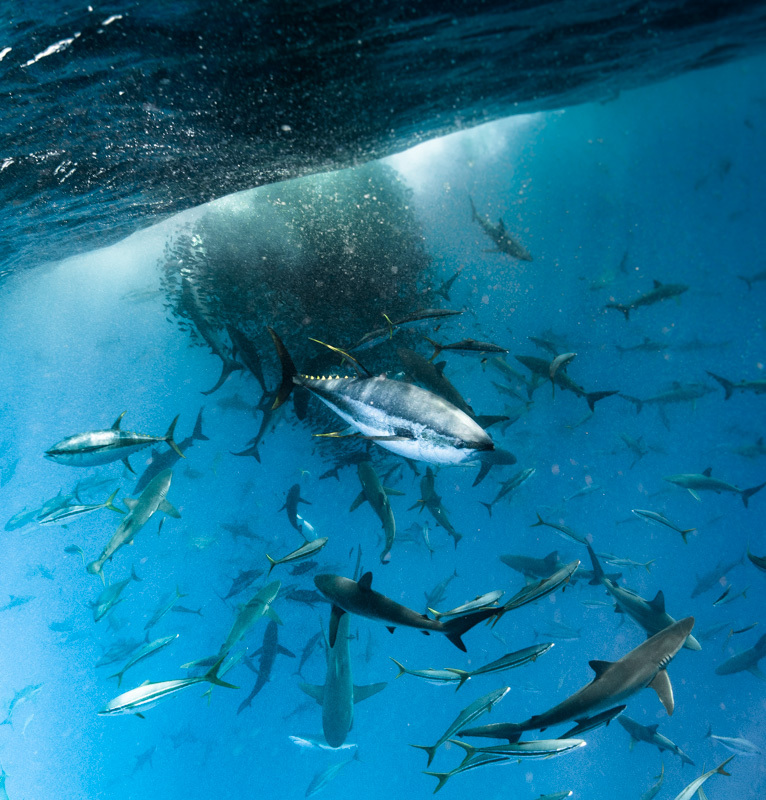 On my way up I was escorted by 3 large yellowfin tunas and several silky sharks, when I reached the surface where James was keeping an eye on me I checked my dive computer: 1min56sec had passed and I saw I was at 39m when I placed the tag, the shark being deeper than 40m. 1min56 doesn’t sound like a lot but without a proper breath up, a indirect descent taking probably 60 or 70m to reach the group of sharks, the lack of reference in the blue, no bottom in sight as well as being in a place where you can bump in any large predator and where you don’t feel at all on top of the food chain, it’s a serious dive. One tag placed during the expedition doesn’t sound like much but it is the first satellite transmitter ever placed on a scalloped hammerhead in that part of the Pacific Ocean. We now have to wait 6 months before it detached from the animal, floats back to the surface and uploads datas to the satellite, hoping it’ll help us to know more about that animal and increase its protection. Many thanks to Quino El Guardian for their support providing us a great vessel to do make these citizen science trips possible. 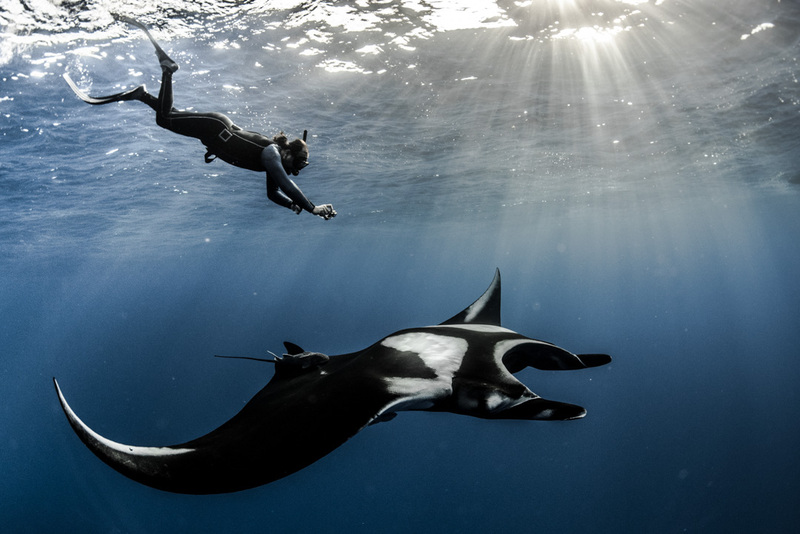 All participants could participate to the scientist’s field work and help them taking part in the shark census, the deployment of bottom cameras, the use of plankton nets as well as taking pictures of the giant mantas for the photo ID database. In the evening we were doing presentations about the area, the conservation issues and the biology of the animals we were diving with.